Most reviewers were impressed by the comfortable feel of the Pegasus 33. A large number of runners consider the price as bang for the buck. Breathability was appreciated by many. Several runners loved the 33rd version of the Pegasus to tackle high-mileage runs or fast sessions. It is stylistically one of the best-looking shoes, according to numerous runners. There are more than a dozen color options to choose from. The traction is superb, as noticed by a good number of reviewers. A few noted that the new Air Zoom unit in the forefoot added pop during toe-offs. The upper dries quickly, based on the opinion of several users. More than a handful of reviewers was frustrated by the narrow toe box, compared to the last edition. It runs a bit heavier than before. Some runners mentioned that the laces come undone several times. A moderate number of users observed that it is stiffer than before due to the outsole changes. A significant number of runners felt a lump on the forefoot of their left shoes that forced them to adjust their strides or give up the shoe completely. The long-standing Pegasus line continues to dazzle, even in its 33rd coming. With several additions in tow, the fit and performance have generally made a good impression on runners of different levels. The shoe offers unbelievable comfort, good arch support, excellent breathability, solid traction, a must-have versatility and a head-turner for looks. At a very reasonable price, runners should have a winner in their feet that mixes style and performance that few can match. I am here to give you all a review on Nike’s 33rd version of the Pegasus shoe model. The Nike Air Zoom Pegasus 33 is labeled as a neutral training shoe that can be used for anything from workouts to an easy run whether you are a professional or not. These neutral trainers provide ample stability and comfort for anything. I have worn all of the Pegasus models after the Pegasus 29, so I have a fair bit of experience with this line of shoes and these are up there as some of my favorites. Other reviewers noted that these shoes were one of the best looking shoes on the market and that is something that I firmly believe as well. These kicks are what the kids nowadays would call “fresh." These shoes are stylish while offering great performance at the same time. These shoes come in a variety of color options including Black/White, Grey/Blue, and Multi-colored (yellow and pink for the most part) to name a few. There are over 12 various color options to choose from, so there are most likely going to be shoes that will please everyone! 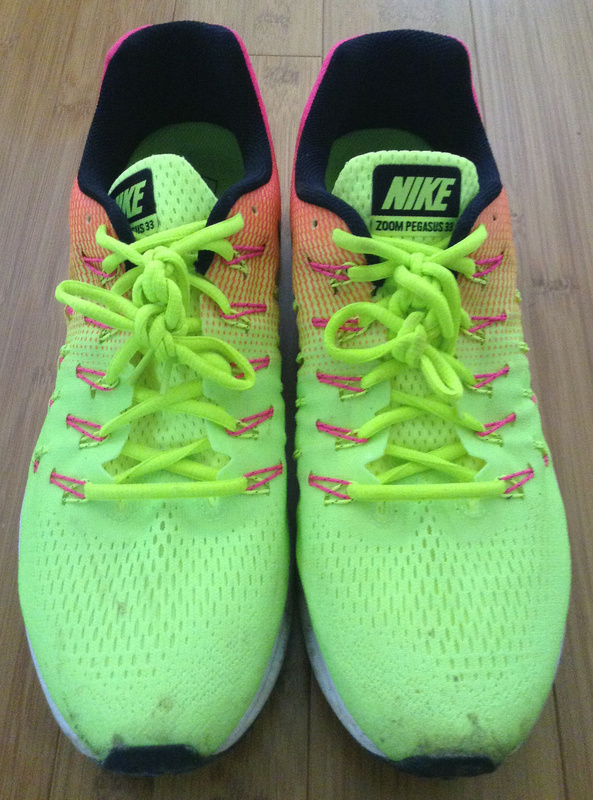 I own a pair that is classified as Multi-colored (yellow/pink), and I love the bright colors so far. They also catch a lot of eyes as I have received an incredible number of compliments on them so far. If they don’t please you based on their color and looks, they will please you with their performance. For me, I love the fit since they are snug thanks to the padded tongue and the collar of these shoes. The upper provides a multitude of benefits. It incorporates the Flywire cord base lacing that keeps the foot locked in place and also provided breathability. The upper also dries fairly quick according to certain others, and I feel the same way. Some reviewers complained about the narrower toe box, but I haven’t had any issues with it being narrow, and I have wide feet. 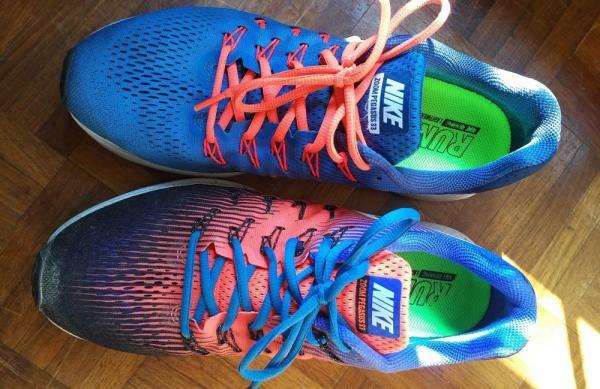 Many other reviewers noted that the Pegasus 33 was very comfortable and I concur with that! However, others complained that it was stiffer than previous models, but I haven’t felt it. Comfort is something that is never lost in the Pegasus line, and that isn’t any different in this model either. These shoes provide an extra bounce to every step due to the newly updated Air Zoom unit. So far, I have experienced a smooth ride after a smooth ride, and I love them! These shoes offer an incredibly smooth and comfortable ride that can be used for all sorts of activities. These shoes have multiple points that work together to lock down your feet and keep your ankles from slipping allowing for a secure ride. They offer nice traction and allow for breathability. On the other hand, however, they do run heavier than previous models, and the toe box tends to be on the narrower side of the spectrum. Some tended to say that it is stiffer than before as well. I have worn the Nike Pegasus line since the 29 came out and used these ever since. My personal favorite of the models I have worn was definitely the Pegasus 30 since that was an incredibly smooth/comfortable ride, locked the feet in place, came in a variety of widths, and truly felt soft underfoot. The Pegasus 33 would be tied for my second favorite with the Pegasus 29 since they both have their perks and downfalls, but these are great shoes if you are looking for something snazzy, reasonably priced, and comfortable for all activities! Can the Nike Air Zoom Pegasus 33 hold up? The Nike Air Zoom Pegasus 33 is a neutral running shoe that weighs in at 10.8 oz and has a 10 mm heel to toe drop. This shoe looks stylish and feels great on feet especially on longer runs. The design and look of the Pegasus 33 make it look sleek and stylish. Even just by looking, the shoe seems fast, and it sure makes you think that you'll run fast in these shoes. The shoe also comes in a variety of colorways to suit your style. The Pegasus 33 has a great cushioning system for your long runs. It doesn't have too much cushioning that makes the shoe feel heavy on the feet. When you first get these shoes, you will feel a bounce from your steps from the zoom air units. This makes the shoe feel more responsive and makes you want to run faster. The shoe is not heavily padded everywhere like on the heel. This means you don't have to worry about your heel slipping as much. However, I still had to do a runners knot to secure my heel a little bit more. It's not that heavy as I barely notice the shoe while I'm running. The shoe also has a flywire system that secures your feet snugly. It keeps the feet from moving around. The durability of the shoe is pretty good so far. I've been running in these shoes for training and walking for almost 8 months now. So far these shoes have held up pretty well. Nothing has broken off or anything. However, one part of the outer sole is starting to peel off. I would say this is fine considering how much I beat up these shoes during training. The Pegasus 33 performed great for anything I threw at it. For speed days on the track or fast tempo runs, it held up keeping me comfortable while making me feel fast on my feet. When I’m pounding my feet on the track to get up to speed, the Pegasus 33 took that beating and still kept me going on for another set. The zoom air unit in the forefoot gives you a little pop off that makes the shoe responsive when you run, adding to the feel of speed. In addition, the Pegasus 33 has no problems tackling longer runs. The shoe is light and does not feel like you are running with bricks on your feet. The flywire allows for that snug feel. On longer runs like 10 miles, my feet were still comfortable. I didn’t experience any major aches or pains in my feet while doing these 10 miles. 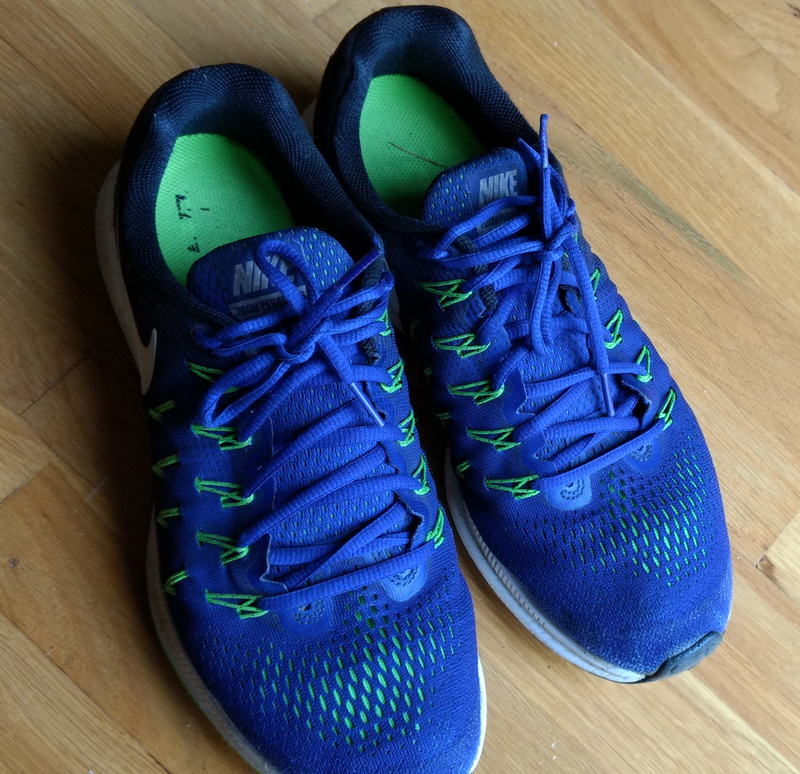 I’ve ran over 100 miles in the Pegasus 33, and it is still going strong, giving me the comfort and cushioning I need for any type of workout I throw at it. The Nike Air Zoom Pegasus 33 is a great shoe with fantastic cushioning and durability. The zoom air units make the shoe responsive and add up to its cushioning. The Pegasus 33 also come in a variety of styles/colors to fit your needs. The only real problem that I have with these shoes is that the laces become untied frequently. Other than that I would highly recommend the Nike Air Zoom Pegasus 33 to anyone looking for a great training shoe! 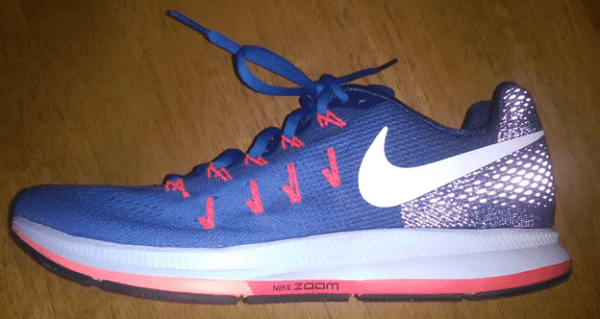 I have already written a review of the Nike Air Zoom Pegasus 33 (NAZP33) a few months ago. I have two pairs and felt justified that this might give me a second chance and another opinion at writing about this shoe. After doing a combined 900km in the two pairs of shoes, I think my opinion to a degree has changed. My previous review was written with shoes within which I had done about 200km, now with additional experience and groundwork, I can add more value to the conversation. So here is my take two on these shoes. NAZP33 is an enjoyable and fun shoe to own, it brings a lot to the table with little to falter. I like going fast and light with comfort to spare. I like the flashy look of modern appeal with plenty of color options. I like a good price for quality and durable materials. With all of that in mind, does the NAZP33 meet my spec. My number one irritant, hot spots, it can be felt under the forefoot. This happens due to a combination of two factors, the insole and the zoom unit expanding. Once your foot becomes hot, the zoom unit in the forefoot heats up and expands. This is most noticeable when walking. The nylon insole coupled with wearing thinner socks can exacerbate friction. I, therefore, countered the problem by running in a thicker natural fiber sock. Uneven wear, the outer sole has more wear directly under the forefoot just after the flex groove, than on other parts of the sole. This I assume is due to the flex groove, when kicking off at the forefoot. Four things, in any given order, make a good shoe - price, comfort, durability, and style. The NAZP33 is an expensive shoe, also looking at the Pegasus 34, which runs on the same chassis as the Pegasus 33. I don’t think the extra money gives it any more value than its predecessor. The upper has really nice material, easy to clean and stay clean. I really like the tight knit of the material, it is easy to wipe off and clean, it is not a dirt magnet. The rest of the upper meets the obvious specifications, breathability, comfort, color and fit, plus a bonus hill reflector. The one stand out is the lockdown fly wire which in unison embraces the foot snugly. The outer shell seems to be hard wearing and after the distance that I already have done, looks nearly brand new. The sole has a nice structured feel with a little more cushioning than your standard shoe. But enough on all the facts and figures, what is important is how the shoe runs. What makes the NAZP33 feel right for me? It makes me feel lighter and faster. I have had a few injuries along my running career, whilst running in the NAZP33 I have not had any injuries or reoccurrences from past niggles. I ran hard and fast, I trained for 6 months in these for an Ultra (50km) and I can say that nothing flared up, especially my ITB. I personally think that the shoes had something to do with it. Due to the comfortable cushioning, specifically at the heel, might be the contributing factor. Outer sole wear - as mentioned tends to run off faster at the ball of the forefoot. However considering the distance that has been done, it is good. If the same carbon rubber was used throughout the sole, as like the crash rail, these shoes would be indestructible. I am invested in two pairs of Nike Air Zoom Pegasus 33, it has been well worth my (discounted) money, taking into account how I enjoy running and looking at them. It’s an all-around feel-good shoe that nearly covers all my ticks in the tick box. I was hoping that the Pegasus 34 might bring a new updated sole/chassis, this would have spiked my interest in wanting to buy another new pair of shoes. With this in mind, I would like to believe that the Nike engineering and design team, comes so close to perfection with the Pegasus 33, that only a color change deemed necessary in the new updated Pegasus 34. My motivation for buying the Nike Zoom Elite 8. What I found in the Elites was that the running experience in whole related to my running style. As a neutral runner with a heel strike, the transition from heel to toe, for me made perfect sense. The sole comfort and ride for my weight (74kg) and medium build proved to be an ideal match. My average pace of 4 to 5 min per km made this shoe a good blend of comfort and speed. Besides, look at it, how visually appealing is this shoe? And there are more vibrant colors to choose from. On the onset, you can see no stitching or patchwork, the sloping sole, and no heavy duty lugs. It just looks fast. At first putting on the shoe, I noticed that the feel was snug and light. Bouncing on the shoe and walking felt really good. Snug to a point that I felt that my usual thick Falke sock felt a bit tight when wearing the Pegasus. I adjusted to a thinner sock and this made it feel roomier. At first fitting, you will also notice that under the ball of the forefoot I could feel something that felt like an orthotic insert. This felt a little strange. Taking out the insole, you will notice that the ortholite is raised where the air pocket has been built into the sole. While running in the shoe, this is not noticeable and does not hinder with the job at hand. This eventually wears in and becomes unnoticed. The sole has an unrestricted role from heel to toe (no structured inserts on the outer sole) with plenty of comfort under heel and forefoot thanks to the air pocket inserts. Outer sole seems durable and I hope to get a minimum of 700km out of these shoes, I will find out in time. While running, the feel underfoot is good, sure-footed and cushioned. Going over some really coarse asphalt, was not a problem, the flexible sole was able to compensate comfortably. I did, however, notice that small stones tend to get captured in the crash rail. If you are pedantic as I am, this can be irritating. I had experienced the same problem with the Elite 8, this does not hinder your run as to a point that you need to stop and remove it. I also feel that the sole could do with some structure, or let me rather say slight structure under the arch or in the arch. The flymesh, flywire and inner sock lining of the Pegasus are in spec with the look and feel of modern top comparative brands. With one exception, I think the Pegasus has a wider array of color choices, not seen by other brand makers. At first glance, it looks simplistic and beautiful. The toe box has an aerodynamic look, and as mentioned can feel restrictive when wearing thick socks. Plenty of ventilation and no foot slide with the flywire lockdown system. Tubular laces, which stays tied without the need for double lace knotting. (See Segment B below.) Nice comfortable heel and ankle support, reflective 3M at the back of the shoe for night running. Materials do have a durable look and feel. The upper is seamless, except for a few stitches attaching the tongue. The edge of the shoelace area, has a gel-like feel to it, again, no stitching. A small thing to notice, but it is all the small things that add up. No plastic inserts, no metal studs in the shoelace holes. These norms of yesteryear, is of no interest to the Pegasus, taking shoe design up a notch, by using a less is more approach. Perfect hill to toe transition. The Nike Zoom Pegasus 33, is a comfortable, medium cushioned speed marathoner or daily runner. It is good value for money and offers top-notch technology with quality materials. The ergonomic design allows for an uncompromising smooth ride. On the flip side, a thick sock is close-fitting, outer sole – crash rail gathers small stones. It could also do will a little structure under the arch. Despite small nuances in the Pegasus, it still does the job and does is so with top marks. In conclusion, it is such a good shoe, that I was convinced enough to buy another pair. Yes, I now have 2 pairs of Nike Zoom Pegasus 33. That validates its stature on my behalf. Nike serves up a host of changes in the Air Zoom Pegasus 33. As trumpeted in the marketing ads, the most significant addition is the Air Zoom unit in the forefoot. It is introduced in the latest version to provide more propulsion during take-off. A slight change occurs in the placement of the Flywire cords. These cords are more evenly spaced out for equal distribution of pressure and to have greater influence in helping runners get their most comfortable fit. The drawstrings are not as exposed as before. They go through a couple of mesh guides to fully integrate the entire upper when it comes to getting the right fit and support. The more precise placement of the Flywire cords also enables Nike to use a slightly softer upper that still provides a secure wrap on the foot. This new engineered mesh helps enhance the comfort and sock-like feel of the upper. Running in low-light areas is enhanced as the latest model of the Pegasus includes reflective materials in the upper. The outsole gets a serious makeover in the 33rd edition of the Nike Pegasus. Most conspicuous in the changes is the inclusion of prominent hexagonal lugs covering the heel to the forefoot on the medial side. With this new development, there is even better traction coming from this shoe. Nike also removed two of the forefoot grooves. The forefoot now features one very deep flex groove. To compensate for this, the outsole now has better rubber articulation or cuts in various sections of the outsole for flexibility. Loyal fans of the Pegasus will find comfort that the 33rd edition is largely similar to the earlier models regarding fit. There is a snug fit from the heel to the forefoot. The heel and midfoot have a very secure locked down feel while the forefoot provides just enough toe room for the toes. The sizing is standard in this shoe. The Waffle outsole in the Zoom Pegasus 33 gets a new feature in the numerous hexagonal lugs covering the medial side of the underfoot from the heel to the forefoot. More substantial cuts are made across the crash pad the and crash rails to add flexibility since the forefoot now uses only a solitary flex groove, albeit a deep one. The heel and the midfoot are covered with sturdy carbon rubber while the forefoot offers blown rubber for better traction. A popular midsole foam in the Cushlon is utilized to handle the cushioning duties of the Pegasus 33. It has decent durability and responsiveness. Nike now uses Air cushioning units in both the heel and forefoot areas of the shoe. For better stability, Nike places a cellulose board on top of the heel Air unit. This midsole configuration has been used in other Pegasus versions including the Nike Pegasus 35. The upper is a sock-like fit with excellent breathability courtesy of the Flymesh. Giving excellent midfoot hold and support are the Flywire cables that are connected to the midsole and looped around the laces. To prevent the cords from causing pressure on top of the foot, a soft lining wraps the interior. Providing security and support in the heel is an integrated heel counter. The huge Swoosh logo acts as the only printed overlay in the 33rd appearance of the Pegasus.